Much of southwest, central, and northeast Iowa have been dropped from a Winter Storm Warning as weather conditions improve over the state this afternoon. National Weather Service Meteorologist Jeff Johnson says Atlantic, Des Moines, Marshalltown, and Waterloo are among the cities dropped from the warning area. 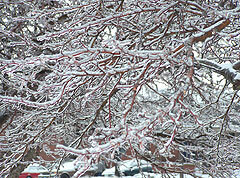 Much of southern and eastern Iowa is coated with ice and snow and could stay that way for several days. Johnson says the precipitation will leave eastern Iowa this evening and the state should remain relatively dry, but cold for several days. The icy conditions are expected to hang around since temperatures will remain below freezing in Iowa through the weekend. "We are going to have some sun, so maybe the exposed surfaces might have a chance to melt a bit," Johnson says, "but certainly it’s going to be very slow since we aren’t even going to get up to 32 degrees." Despite widespread power outages, this latest winter storm could’ve been worse. Johnson says winds are relatively calm, meaning ice-coated electrical lines are less likely to move and snap free of power lines. The Iowa Department of Transportation website has updated road conditions.